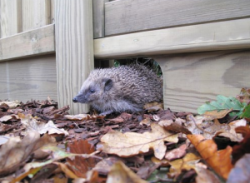 Hedgehog populations have been declining by about 25% in the last 10 years. One thing we can do to help them is to make sure they can move freely between gardens, so that they have enough to eat and space to make a home. Jacksons Fencing have brought out a hedgehog-friendly gravelboard to go under fencing, so the hogs can get between gardens. (The page also features a cute video of them using one.) It has a suitable-sized hole at one end, with a reinforcing strip along the top to keep the board strong. If you want to create your own hole, see this hole template for how big to make it. You can even add your hedgeholes to the ‘Hedgehog Street’s Big Map. You can download the Wildlife Trust booklet, Get Creative for Hedgehogs , which is full of facts and further advice on how to help hedgehogs. It also contains instructions for building your own ‘hedgehotels’. In South Northants. we are lucky to have a thriving group called Brackley Hogwatch, which will help if you are concerned about a hedgehog; go to http://www.brackleyhogwatch.co.uk/. Elsewhere you can consult the British Hedgehog Preservation Society. Next post: What plants do you need for your space?